As a couple psychotherapist I often hear couple complaints about each other as a manifestation of an unhelpful symbiosis. Imagine this is a stage play and you are the director and your partner is the actor. You are directing the actor and the actor is trying to meet your expectations as the director. The one is dependent on the other as if these two unique individuals are operating as one individual, where one may be the director in a particular environment and the other the one trying to please. In a sexual relationship the director of the other thinks they can do a better job than their partner, although often gets resentful at having to make the decisions and be the one taking the lead. This comes at a cost, as the one taking the more active role often gets tired and over burdened and will think their partner takes them for granted. The partner, who is being directed and trying to please, often gets resentful at the criticism they get as their efforts to please often fall short of expectations, leaving them feeling hurt and not good enough and often they will give up on trying, as what’s the point. These roles can change in different environments and explains the ‘traditional’ split into roles for partners where the woman has taken on responsibility for home and child care, even though she may work, and the man has taken on the role of providing. This way of organising responsibility results in an unequal split of power and responsibility. This results in a co-dependent merger of two thinking feeling people into one. It’s important to remember here that each person is willingly in a role, albeit out of their awareness, and so they are both co-creating and colluding with their relational dis-satisfaction. This all creates a lot of confusion and frustration that will be held as resentments and disillusionments by each person. Resentments and disillusionments are manifested from mixed messages flowing from this way of being in relationship and are acted out between the couple. You ask your partner’s help with household chores or childcare, but you scrutinise what they do, even doing it again, so sending the message that everything they do is wrong. Their way of doing chores around the house will be different to your way and trying to make them do it your way disrespects them. Let your partner do it their way, practise and learn from their efforts. You may complain that your partner has no interests or friends but then make it very hard for them to invest time in forming friends and interests by criticising their choices or piling them up with other responsibilities so they don’t have time. It’s important for a couple to identify the unhelpful and corrosive effects that an un-equal symbiotic power struggle can have on their relationship and to develop equality and respect for the co-existence of two different people in one collaborative relationship. There is always a deeper emotional unmet need that lies beneath each person in a symbiotic relationship. The symbiosis ‘masks’ the emotional unmet need. Couple therapy explores the current symbiotic mask and moves in deeper to find and meet the unmet needs. 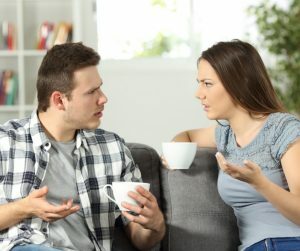 The symbiotic way of relating comes with a lot of frustration, energy, tension or ‘affect’ and it is this affect that gets vigorously tossed around from one to the other as internalised disillusionments and resentments then escalates into defensiveness, bickering, criticism, rowing, and ultimately contempt and stone walling. 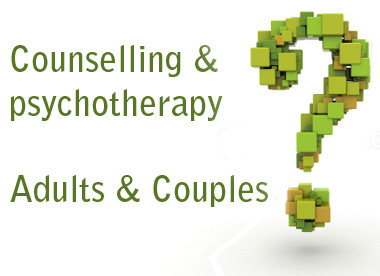 Often couples wait a long time to seek help and couple therapy has to address the years of hurt, pain and damage that the symbiotic relationship has caused, whilst preparing the ground and building the foundations for each to trust the other. Now the affects of frustration and tension can be interrupted by addressing each part of the mixed message and putting words to what lies beneath having to ‘carry the burden’, or ‘having to please’. When your partner’s words, sense and meaning are fully explored then the hurt will be found. This understanding of hurt and fear is deeply validating and allows one to walk in the shoes of the other and so know through empathy what is needed. This is where the growth, the healing and the hope lies for a different inter-dependent way of being with two different fully aware thinking and wholly feeling individuals.